A suborbital UP Aerospace rocket soars on May 20,2011 launch, pushing an eclectic mix of payloads to the edge of space on a suborbital trajectory. The rocket carried student experiments, cremated human remains and wedding rings on the short spaceflight. This story was updated on May 24, at 2:43 p.m. ET. SPACEPORT AMERICA, N.M. — A rocket packed with everything from wedding rings and science experiments to the cremated remains of the dearly departed— even New Mexico home-grown green chili — launched to the edge of space and returned safely Friday (May 20). The New Mexico Space Grant Consortium paid UP Aerospace for their services. This is the 3rd Annual New Mexico Education Launch and is a New Mexico Space Grant funded launch though a NASA program. Spaceport America served as the launch facility provider. The consortium sponsored the flight to promote science, technology, engineering and mathematics programs for students from New Mexico, Texas and Arizona. The Friday rocket launch, as well as the year-long campaign that enabled students to build the experiments that flew, were sponsored by NASA through the Summer of Innovation Program. 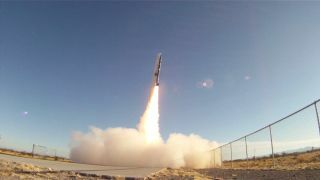 "It was a perfect flight … an outstanding day," said Jerry Larson, President of UP Aerospace in Highlands Ranch, Colorado— the company that designed and operates the 20 foot-long rocket. Altogether, the launch took about 15 minutes from liftoff to landing. Packed in the rocket’s payload section were nearly 30 student experiments carried to the edge of space in canisters that then returned back to Earth via parachute. "We actually set a record here at Spaceport America … 73 1/2 miles. This is our highest flight that we've had to date," Larson told SPACE.com. "It was picture perfect …everything functioned just beautifully." The investigations included: a look into magnetic levitation, a sensor to measure radiation levels at high-altitude, the measurement of sound propagation through a vacuum, and a project to determine if temperature in space has an effect on electrical components. Three high school experiments and one community college experiment were supported by New Mexico Gross Receipts Tax revenue, dedicated to supporting spaceport-related education. “These missions create enthusiasm and interest in science and technology,” said Pat Hynes, Director of the New Mexico Space Grant Consortium. The experiments give both students and teachers an educational opportunity that can’t be found anywhere else, she said, and inspire students to engage in aerospace and space research. Riding aboard the SpaceLoft XL were capsules containing cremated remains of departed loved ones. This commercial memorial spaceflight was labeled “the Goddard Flight,” offered by the space entrepreneurial firm, Celestis, Inc. of Houston, Texas. The flight was named after the father of American space exploration, Dr. Robert Goddard, who performed much of his pioneering aerospace work in New Mexico. "We had flight capsules from 20 Memorial Spaceflight participants and digital 'star information' from more than 45,000 Name A Star Live customers aboard SL5," Charles Chafer, chief executive officer told SPACE.com. "All were successfully returned to us by UP Aerospace, marking the 10th Celestis mission to space." The now recovered Celestis capsules and modules are being returned to family members and loved ones, providing them with a flown keepsake. According to Celestis, among the remains of those flown into space were ashes of Leonard Majeske, a NASA aerospace engineer who worked for legendry rocket pioneer, Wernher von Braun. Also onboard were remains of Brenda Jean Sartor, a mechanical engineer who suffered from muscular dystrophy. Her physical limitations kept her from reaching a desire to become an astronaut. But as a dying wish, she wanted to send part of her cremated remains into space, according to a Celestis statement. A 30-year veteran of private sector space business development, Chafer said he is ready for "overnight success" status. "It seems a lot closer than it ever has," Chafer said. "This is true commercial operations. You really see that in the efficiency. It's very impressive, with UP Aerospace, Spaceport America … the cooperation between them all and White Sands Missile Range. It's the way things are supposed to work." Chafer said that his company’s next flight of cremated remains will be on an Earth-orbit mission, now projected to occur no earlier than July 15 of this year. Also on hand for Friday's launch, with fingers crossed, was Chuck Lauer, Business Development Director for a new entrepreneurial effort called SpaceWed, which aims to offer wedding rings flown in space. "What we’ve got is the first-ever commercial space wedding rings payload into space," Lauer told SPACE.com. The booster took to space one matched set of rings, along with 2.5 ounces of pure gold. The space company SpaceWed is set to offer space-flown wedding rings. The company launched a set of wedding bands on the SL-5 mission by UP Aerospace on May 20, 2011. "This is the start of a commercial project named space wedding rings.com," Lauer said, adding that couples will be able to use a website ordering process to pick from rings crafted by boutique jewelry designers. Each set of Space Wedding Rings will be assigned a unique serial number and engraved with the SpaceWed logo. The rings will be sold in custom designed, space-themed packaging and will include a Certificate of Space Flight, as well as a DVD and photo album of the rocket launch. Prior to the launch, couples will select their favorite set of rings from a catalog. The rings will then be custom sized, ensuring a perfect fit upon their return to Earth. The cosmic wedding rings will then be flown on future UP Aerospace vehicles or suborbital rockets taking off from Spaceport Sweden, Lauer said. The company's heavenly credo: "Bringing together ... the power of love and the power of the universe." This story was corrected to reflect the correct sponsor for the SL-5 mission. Leonard David has been reporting on the space industry for more than five decades. He is a winner of this year's National Space Club Press Award and a past editor-in-chief of the National Space Society's Ad Astra and Space World magazines. He has written for SPACE.com since 1999.